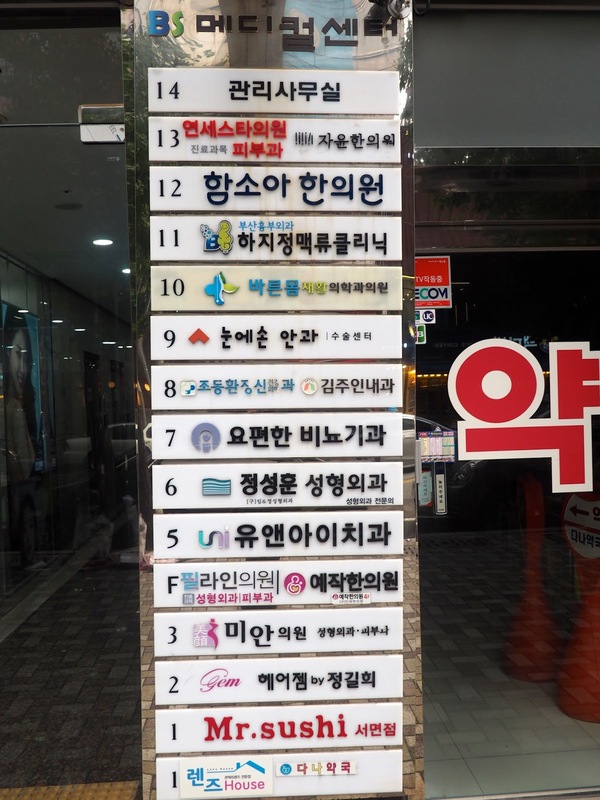 I'm terrible with street names, especially the Korean ones, which have a different format, and I wasn't really paying attention to which streets I was on anyway, since it was quite an aimless wander, so don't rely on me for any specific directions! 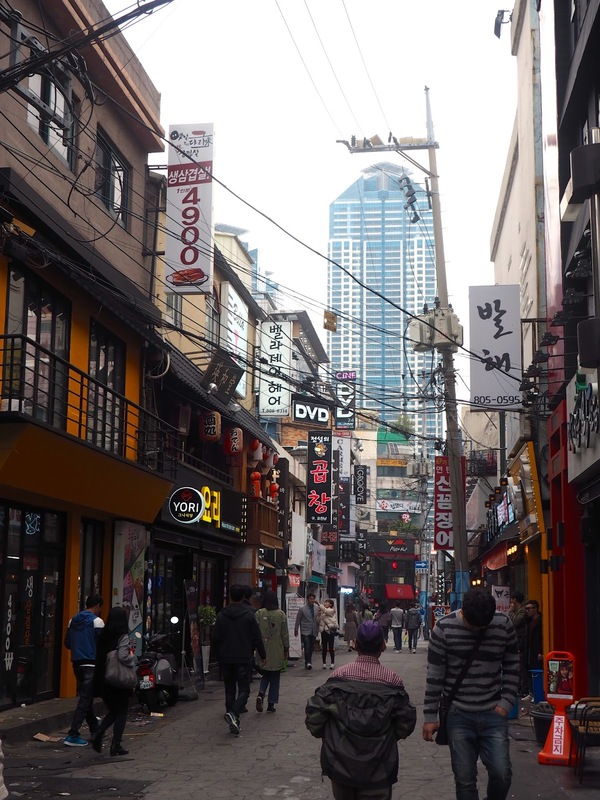 Seomyeon has a few big, wide streets, busy with traffic passing through, and then lots of smaller streets and alleys, mostly populated by pedestrians. I wandered the larger ones first, which often have trees and flowers dotted around, making things feel a bit fresher and more colourful than they would without. The buildings lining these streets, and indeed all streets, are covered in big, colourful signs, mostly with only Hangul lettering on them (there's the odd bit of English in amongst it), so you can see why I was a quite lost and confused when I first arrived and couldn't read a thing anywhere! A lot of the buildings have various businesses on each floor, so each level of the building's exterior has it's own big, bright sign, as you can see pictured. That said, after living in Hong Kong, these 10-15 storey buildings feel pretty small in comparison, for me at least! The smaller streets can be fun to explore too I discovered; some feel very empty, and a bit sketchy, but others are busy with people. The most interesting are the streets with food carts along them, mostly run by older men and women, with umbrellas or tents covering them, and who cook whatever food they're selling in front of you and serve it hot and steaming. I found one street with a whole row of sellers along it, while others are dotted about on their own. Sometimes they have a whole tent over their stall which is big enough to have a seating area, if you want to stop to enjoy your food. Often though, there's no menu, or it's only in Korean, so for foreigners like me, you just have to point at what you want and hope for the best! I found that the area east of the main road is where most of the shops are, and large sections of this area may as well be pedestrianised, as everyone walks down the middle of the road, and most traffic tries to avoid the smaller streets. 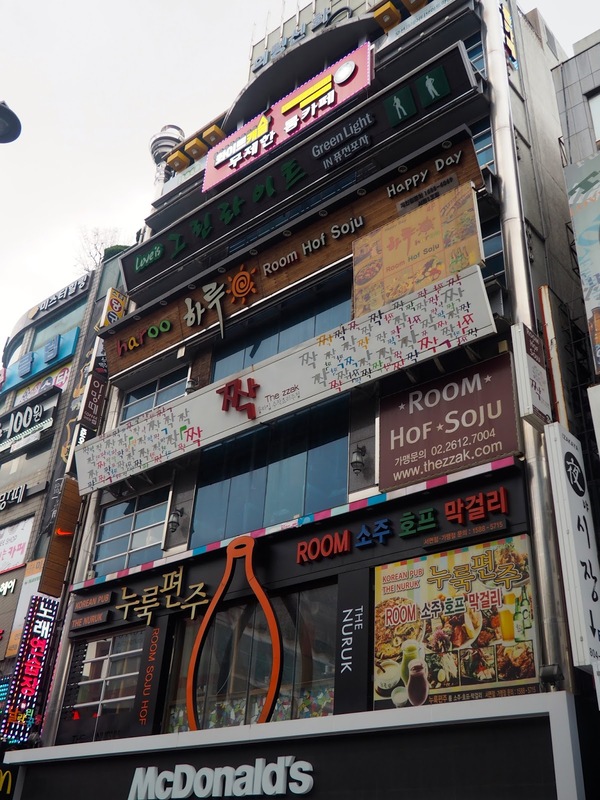 The shops here have everything from international brands, like Nike and H&M, brands I recognise from around Korea, and smaller, independent shops. 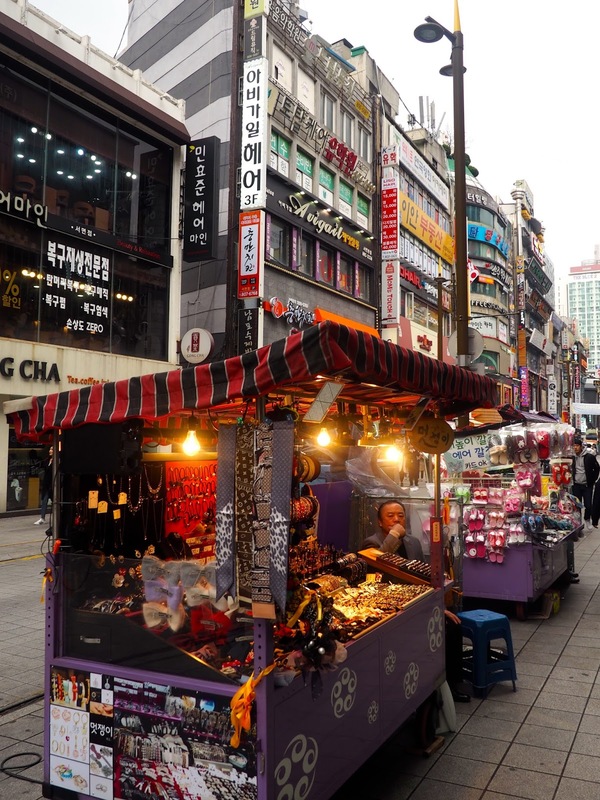 It feels quite similar to the shopping streets in Nampo, where you'll find similar goods. Also like Nampo, Seomyeon has a large underground shopping centre, accessible directly from the subway, or from numerous other entrances. I tend to prefer being out in the open air when I'm shopping, as I find these low-ceilinged centres to be a bit busy and claustrophobic, but there's no denying there's plenty of choice. 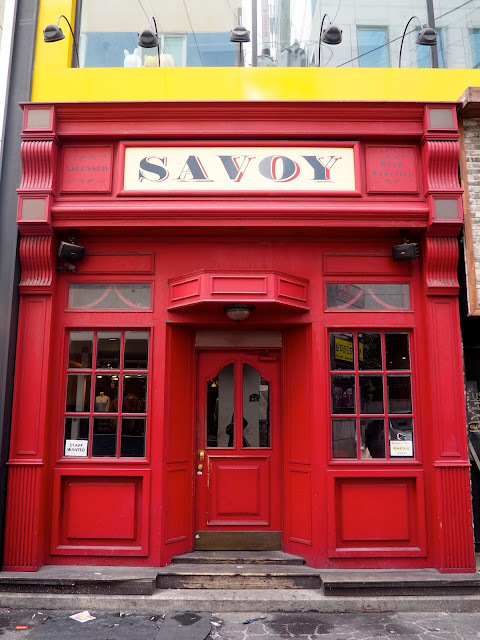 Though when so many places are brands I'm unfamiliar with, it can be difficult to know where to look if you're looking for something specific! 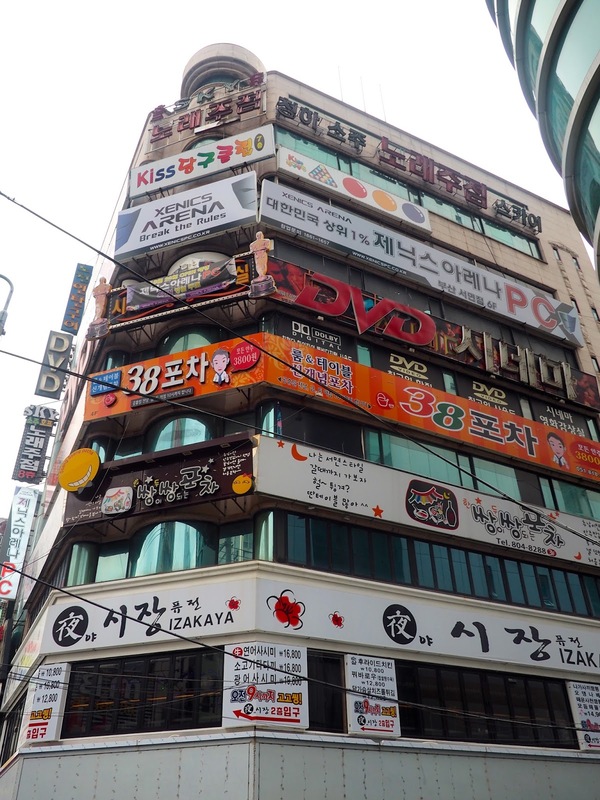 Many of the buildings in this area, and most other places I've been, including Nampo and parts of Seoul, will have the shops on the ground floor, while bars and restaurants take the upper floors, so it's often a good idea to look up while wandering around, to see what else there is around. There is a little knot of streets though with less shops, and everything is restaurants and bars. Many of these are Korean style restaurants, mostly BBQ, and you'll have to hunt a bit harder if you want any other cuisines. It's easy to spot the barbecue places, with their extraction fans hanging over every table, and cooking areas in the middle of each one, as you can see pictured. These are the streets I've been to the most so far, for evenings of dinner and/or drinks, but they twist and turn, and have so many small back alleys that I still lose my bearings and come across ones I've never seen before! It was funny being here on a Sunday afternoon though, when most of these places were closed, and you can still see the remnants of Saturday night scattered outside. I did enjoy having quieter streets though, especially so I could get some of these photos of quirkier exteriors, without people in the way or being jostled around. I did come across a few places I might venture back to in the future, mostly shops and cafes that looked nice, but overall I think I prefer Nampo, or so I decided after my roaming around. I will certainly still go to Seomyeon, if I want to go somewhere like H&M, or for central meeting points for dinners, or its fun atmosphere on a Saturday night, but I think for shopping or dinner most of the time, Nampo is a bit nicer (Seomyeon feels a little seedy to me sometimes), and I'm glad I live near that area. Seomyeon is certainly good for experiencing some day to day features of Korea though, since it lacks any tourist-like attractions that you'd likely otherwise be drawn to, as I mentioned, and things like the street food carts and the barbecue places are smaller, interesting parts of Korean culture. If you're visiting Busan, you might be interested in some of Trazy Crew's tours in the city, such as their Busan City Tour Bus Discount Ticket or their Busan 1 Day Small Group City Tour. I haven't done these myself, but I am an affiliate for the company.